The best joinery company on the market! Say Hello To MTM HERMAN! A joinery company with many years of experience, MTM Herman offers incredibly reliable bespoke joinery services! The best bespoke furniture around! Whether you’re looking for doors, windows, wardrobes, or other furniture – we’ve got exactly what you need! Our friendly operators will answer each of your questions and give you a free quotation. Don’t hesitate and call us today! At MTM Herman we believe that each house deserves the design that reflects the sophisticated taste of its owner. That is why we offer bespoke fitted furniture adjusted to the area available and the client’s expectations. Our products are not manufactured – they are handcrafted with great attention to detail. We also select the highest quality materials in order to achieve the most amazing, most beautiful final result. We offer solutions for every kind of house. It doesn’t matter whether you would like to refit your old farm house or you want to introduce a new look to your cosy London flat. Our experience allows us to craft bespoke furniture according to any style and spatial requirements. As a result, we answer the needs of people enjoying bold, innovative styles, as well as those of you who appreciate traditional, toned-down projects and solutions. Make every part of your home unique and of the perfect size with MTM Herman’s incredible bespoke furniture. Bring in the outdoors in style thanks to our incredible French door service. Keep your books in place in style! With our incredible bespoke bookshelves, you can enjoy your books in peace for long! Whether you like tradition or modern solutions, you really can’t go wrong with our casement windows. Save more space and customise your interiors at will with the genius invention that bi-fold doors are. No kitchen can serve you better than one made specifically for you – with our bespoke services, that’s exactly what you’ll get. Want a window that’s both nostalgically classy and practical? Our casement windows are just what you need. Need more space for your clothes? Get a bespoke wardrobe – one that will take up the perfect amount of space while giving you tons of clothing space! Storage space can be tricky – but with our bespoke cupboards, you can get exactly the right amount of space that you need. Make sure your front door is not only sturdy, but also unique and eye-catching with our incredible front door craftsmanship. Looking for a sturdy desk that will be perfectly tailored to your needs? Let us make one just for you! Have you got a crevice that is just begging you to use it? See what we can do with it with our built-in wardrobe service! MTM Herman’s team understands how important it is to skilfully combine elegance, ease of use, and functionality. Which is why our bespoke fitted furniture is not only great to look at, but also amazing when it comes to its everyday use. The wardrobes, cupboards, shelves and other items are very solid and practical, thus you can enjoy their advantages fully. We boast years of experience in the industry, skilled craftsmen, and every project is handled with great care. We realise how important it is for you to get the perfect bespoke furniture for your house and we make all the effort required to satisfy your needs. We listen to your ideas, translate them into a plan of work, select the best ideas and create some of the most original solutions, ideal for your London flat. If you have any questions regarding joinery – whether it’s something you need in your home, or if you just want to learn more details about our line of work – contact us now! We can give you all the details you need, as well as a free quotation if you decide that our services are what you’re looking for! 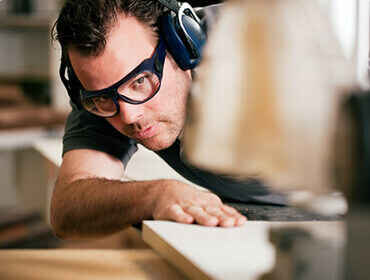 At MTM Herman, we do our best to deliver the most reliable bespoke joinery solutions to all of our clients. But don’t take our word for it – many satisfied clients have shared how happy they were with our efforts. The doors MTM Herman crafted for my home exceeded all of my expectations. I love the look and I’m 100% sure I’ll ask them for help again in the future! Just wanted to say a big thanks to Mirek and the guys. We have had a full set of double glazed wooden sash windows installed now and couldn't be happier with them. We have had no end of compliments about the windows and would definitely recommend MTM Herman to anyone! Thanks so much! MTM Herman have done an amazing job on both my now double glazed sash windows and now my oak bedroom wardrobes. After getting several competitive quotes I chose MTM because of their cost, quick turnaround, but mainly because of the workmanship, I would recommend them to any one needing high quality carpentry. All items are bespoke and made from their own local workshop. Mirek and his team fitted two new sash windows in my period flat and refurbished 3 others. I'm very happy with the quality of their work - every single window now looks so beautiful and is a pleasure to use! The whole team was very professional and took pride in their work every day. I will definitely use again and recommend to everyone! I was looking for a sturdy and reliable door for my patio and MTM Herman delivered all of that. The door looks so solid that I can imagine it lasting for many years. Mirek, Tomas and his team have done another amazing job . They have just installed the remaining 3 hardwood windows ( they have done three to date plus double doors before this ). These latest windows included curved glass and frames which have been produced and fitted to the highest craftsman ship . The team are courteous, polite, on time and clearly take pride in their work . No hesitation in recommendation . In fact we are already thinking of the next job ! Mirek and his boys have just finished replacing all the windows and French doors in our house. I have to say that I am beyond impressed at the professionalism, efficiency and thoroughness of the way they completed the job not to mention the beautiful quality of our lovely new windows and doors. Highly recommended and I am now thinking about what else I can ask them back to do!! MTM Herman were recommended to us and have just replaced some of our windows. We're delighted with the quality of the workmanship and the care they took whilst in the house. We won't hesitate to use them again. MTM Herman replaced our balcony doors-they were efficient, friendly and the service was generally excellent. The doors were hand built-and they did the job in the exact times predicted. I would recommend them again. Good quality, very efficient and accurate - changed windows in our newly refurbished flat without damaging other interior. Our windows sach windows now looks truly amazong, MTm comes very well recommended! I needed some new windows for my home and I was not disappointed. Thanks to MTM Herman, my windows now perfectly complete the traditional look I was going for with my house. MTM Herman recently installed a series of bespoke cupboards for us. The assistance and advice on design, the quality of work and commitment to a tight timetable was exceptional.After installation and painting, MTM Herman returned on the weekend to make adjustments to ensure the cupboards were absolutely perfect. Marek's commitment to quality and customer service is of a very high standard. Mirek made some bespoke internal folding pine doors for us. The doors are of excellent quality and far exceeded our expectations. Dealing with Mirek was a pleasure from start to finish. Great job building and fitting sash windows. Extremely professional first rate job. Handcrafted, made to measure furniture may be either stylish, traditional or suited to modern apartments. All of uor bespoke fitted wardrobes, windows and other products are made of high quality wood, such as oak, pine, birch or mahogany, depending on your wishes. Get in touch with us with any questions you might have. You can call us, send us an e-mail or visit us in London office personally. The contact data is on the right.